So do you think it was blingy enough?? I do not know why my black holo's never show up! Even when it is bright and sunny I can never see it. I could have added some rhinestones but I just wasn't feeling like rhinestones. Sometimes I don't like feeling the bumps on my nails. That OCD! I do like the studs though. The studs that I have hardly stick out at all so I am not rubbing them all day. 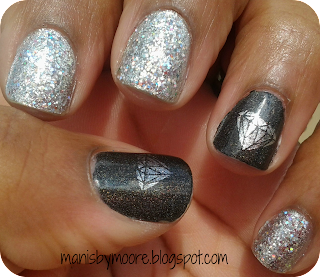 What is your favorite nail art items that you bling up your manis with?? Do you like rhinestones?? 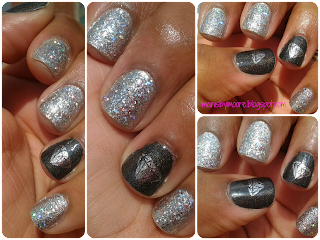 wow that silver glitter polish is stunning!!! How did you get your inlinkz to work? When I pasted it into my post it showed up as last weeks? I think I must be doing something wrong? I post each weeks code to my Tuesday post. Each week has a different code. I have missed you!! That silver is beautiful!! Thank you!! Yay!! You have been posting some great manis!